Like in RFEM, load combinations can be automatically generated in RF‑PIPING. 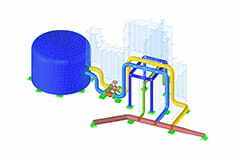 This feature is activated by default and creates the recommended load and result combinations for piping design. It is necessary to assign the relevant action category to load cases in order to generate correct combinations. For this, there are new action categories implemented specifically for loads on piping. Pressure temperature conditions are generated as the sets of the first (second, third, etc.) load case of the “Pressure” category and the first (second, third, etc.) load case of the “Temperature” category. The default setting can be reviewed or adjusted in the “Grouping of Thermal and Internal Pressure Load Cases for Operating Combinations” dialog box that you can open by clicking the corresponding button in the “Piping Load Combinations” tab of the “Load Cases and Combinations” dialog box. This dialog box is automatically offered to check your entries in the case of any change of the load case from the “Pressure” or “Temperature” category.